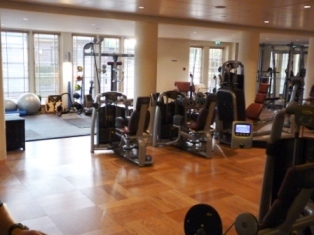 Training celebrities, working at the famous Grove Hotel in Hertfordshire and being a former powerlifting competitor are just a few of the attributes Mark Alexander can boast about. Though those of you lucky enough to spend time with Mark will know that boasting isn’t something he does and its his humble nature that makes him so good to train with and I for one can personally vouch for that. I always try to interview people with something interesting to say about working out and eating better and Mark is someone I’ve had a number of debates, conversations and between sets physiology lessons with which impressed me enough to want to interview Mark so everyone else can benefit from his vast knowledge of all things training. In this interview you get an insight into Mark’s personal training style, see a video sample of a personal training session with Mark and even download a sample workout and diet plan put together exclusivley for this interview! Skye: You recently trained Ralph Fiennes for his new movie Coriolanus where he stars alongside Gerard Butler. How did you get the opportunity to work with Ralph and how did you tailor his workout and diet plan? Mark: I was very lucky as he was staying at The Grove hotel where I work while he finished filming the last of the Harry Potter films. My manager at the time asked me to help train him 5 times per week for 6 weeks. We alternated who would train him and Ralph really did push himself. I gave him a diet plan that he could work around his filming and really pushed him in the gym. Lots of compound movements mainly but he did love his isolation exercise for his arms. Skye: Give us a feel for how you work with your clients to help them achieve their physique goals? Mark: I always sit down with them and discuss nutrition, the type of training I like to teach, fitness testing and also the personalised gym program they’ll be doing on their own. 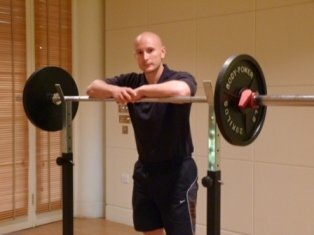 I really think it’s important for my clients to learn how to do new exercises and understand different training techniques and progressions so they can slowly start training independently. In my weight training sessions I try to get the most out of my clients and try to hit each exercise a bit differently each week to make sure I’m shocking their bodies. Overall I think I really try to not just change people’s training but their whole lifestyle and ways of thinking about fitness. Skye: What makes the personal trainers at The Grove different to other gyms? Mark: As we have a small exclusive membership it means we can give a much better service. New members receive an initial assessment where they come in and have a chat with us about a range of topics such as their health history, training history, goals and nutrition so we can deliver the best possible fitness regime for them. We will also conduct basic fitness testing so we can track their progression over time. After the initial assessment they come in again so we can go over every little detail of their programme so ensure they feel 100% comfortable with it. We then encourage them to progress and adjust when necessary. They can come in for a many reviews as required and also receive 2 free personal training sessions. I find this helps to build a great relationship between the trainer and client so their goals can be realised. Skye: Many personal trainers get the qualifications and then never update their knowledge. How do you keep learning and gaining experience that will benefit your clients? Mark: The fitness industry is always changing so it’s good to keep up to date with the latest technology but we shouldn’t shy away from the things that work. Every time I come back from a course I’ve learned something new to try with my clients but in reality eat clean, lift weights and do some cardio you will always get results, fact. Skye: What tracking tools do you use for clients to demonstrate their progress when following your diet and workout plans? Mark: I stick to the basics like body measurements, weight and pictures. Nothing works better and all are quick and easy to do and record. Sometimes I like recording every set and every rep and aim to try to beat it next session and other times I’ll change the exercises each week or add drop sets, supersets, 30 rep sets (with 10 rep max), forced reps or even 1 ¼ rep training. Shocking the muscle is the key so I love playing around with everything to see what works. Skye: Can you tailor workout plans and diet advice for people with specific injuries? Mark: Funnily enough, I’ve had a few clients recently who have back & knee problems. Those types of clients are good to work with because it’s nice to see them able to complete an exercise they thought they couldn’t because of the injury. It’s all about making small changes and progressions and getting used to doing normal daily movements like squatting and deadlifting, we all do these two movements everyday when we’re lifting boxes etc so they need to be done. Skye: How would you set up a workout and diet plan for someone with very limited time? Mark: Each person is different so its quite hard to answer but in general, a workout plan that is high intensity with little rest to squeeze in as much as possible. It would include lots of supersets with opposing muscle groups and a diet that could be very easily prepared by making a few big meals and breaking them down into smaller meals to be consumed throughout the day. Skye: You helped devise the very successful Bikini Boot Camps at The Grove in 2009 and 2010 which garnered a great deal of media interest from The Metro, Times Online and many other notable publications. 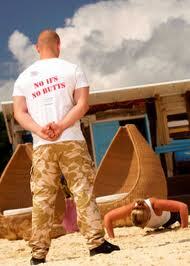 Tell us how you were involved with the Boot Camps and the results the participants achieved? Mark: Again I was very lucky to be able to lead the boot camps and put some of my ideas into it so we could deliver the best possible package. The boot camps were designed to give people fresh ideas on exercise and nutritional information so they can change their overall lifestyle rather than major weight loss in a short period which was not the aim. I took all the nutrition talks, designed the beach circuits and helped with the activity order. Overall everybody really enjoyed it and we got great media coverage . Skye: You have a keen interest in powerlifting and you’ve previously competed as a junior where you squatted 160kg, benched 110kg and deadlifted 190kg. You also competed at the British BWLA Bench Press Finals in 2008 with a bench press of 120kg. Tell us more about your powerlifting background? Mark: When I first got into the industry my brother and I took a great interest in powerlifting. I remember looking on the internet for all the information about weight classes, rules, meets etc and then videoing our lifts to make sure they would pass in a real meet. Learning to squat, bench press and deadlift properly from the start has helped me so much as a personal trainer and it’s for this reason I try to get all of my clients to do all these basic movements. Skye: What’s the secret to moving heavy weights and will you be competing again in the future? Mark: I think the secret is consistency with training and nutrition and making sure you rest enough. When I first started training I would rarely have a day off from the weights, but now I always have three days off a week and make sure I periodise my training with lower and higher reps. I really hope to compete next year in a few Great Britain Powerlifting Federation unequipped meets, training has been going well. I have been squatting 165kg for 5 reps, bench pressing 120kg for 5 reps and deadlift 190kg for 5 reps so we will have to wait and see what my one rep max will be so watch this space! Skye: How does Mark Alexander train and eat when he’s not training clients? Are you a “do-as-I-say-not-as-I-do” trainer or do you practice what you preach? Mark: My own training is spot on; I never miss a day and just love training. Now the food side is 50/50 really, in the winter months I don’t mind eating a few takeaways or bad meals each week as long as I’m still eating well for at least half the day. In the summer I’m very strict and at the moment I’m on a very slow diet eating 8 meals a day and I’m finding myself not craving the junk yet. I usually have one cheat meal per week with my girlfriend but the rest is like clockwork. Skye: As a personal trainer you’ve had access to a lot of training equipment both good and bad. If you were setting up a home gym with a limited budget, say £1000 what equipment would you recommend? Mark: I’m a big fan of the basic compound lifts so I would advise an Olympic barbell & dumbbell weight set with enough plates to grow into. I’d also recommend a power rack to do the big movements, an incline bench, cheap dip station, skipping rope, mirror, chalk and some decent music. If you search around you could easily get all of these things for under £1000. Skye: If you had to choose the 3 most effective exercises what would they be? Mark: The squat is my number one choice! Great for everyday function and works all the muscles in your legs and back. I don’t think I would ever NOT put a squat exercise in one of my workouts. Also, when teaching new clients to deadlift it’s easy to teach as you can work at different heights to really perfect technique rather than have them hitching a bar from the floor with bad posture. Number three would have to be the clean and press. When done with higher reps (10-20) it’s great for cardio and working all the major muscles starting with a deadlift, into an upright row, catch, then a little squat and finishing with a overhead press. With all these movements in one exercise think of all the muscles working and extra calories you would be burning. Skye: As a personal trainer, do you find that women are reluctant to train with weights for fear of getting big and bulky? I come up against this problem everyday of the week. Mark: It’s hard to change people’s way of thinking but once they try weight training they soon realise they haven’t become massive in a month they then start to enjoy it. Some of my female clients have lost a ton of weight and reshaped their bodies through a solid weight training program, good nutrition and cardio. In my opinion every woman out there should be doing some sort of resistance training to keep their muscles strong and their metabolism through the roof. Skye: What are the simplest changes people can make to their diets that make the biggest impact on their physiques? Mark: I think moderation is the answer. When people think of the word ‘diet’ they think ‘I can’t eat what I want’. I try to encourage people to start slowly and change one thing at a time, for example drinking 2 small glasses of wine instead of the bottle, or half a chocolate bar instead of it all. Skye: Diets fail because people believe they can’t eat foods they crave and that they have to practically live in the gym. People are often surprised how flexible my diet is and how little I workout, do you think finding that balance is key to long term weight maintenance? Mark: Most definitely, most people kid themselves and think after a few weeks of dieting they should be at their target weight. “Bad foods” in moderation and a healthy diet of proteins, carbs and good fats will always do the job. If you don’t think you’re cutting foods out completely then you shouldn’t get as many cravings, less cravings means you’re less likely to overeat. Skye: – In my opinion, possibly the single biggest problem with peoples diets is they don’t eat enough protein. How can people boost their protein intake? Mark: Eating more meats and fish is a start but some people don’t like to eat too much of these types of foods. Carb based foods like beans, oats, wholemeal breads have a good amount of protein in them so as long as you stick to those types of carbs then at least you will be increasing your intake a little. Also adding egg whites to different foods can be very easy and convenient as you can now buy liquid egg whites in cartons. Try adding some to rice or making a veggie egg white omelette. The key is to keep your protein sources varied and cooked differently. Skye: Do you advise clients to take supplements? If so what supplements specifically and what supplements do you personally use? Mark: I do but I never push it on people, protein supplements are a great way to get an extra meal while busy at work or to stop cravings. Supplement are exactly that, they are there to supplement your diet not replace whole foods. Whole foods first and only then should you use supplements if you not getting enough from your diet. I personally use an all-in-one blend of protein, carbs, creatine and hmb after my training and between meals and also a flavoured whey protein that I mix with my oats before gym. I also have the whey protein at breakfast to help bump up my protein intake and keep my cravings at bay. Both products I get from myprotein and I’ve used them for years and never had a problem. Skye: What’s the best thing about working at The Grove? The opportunities I have had including training a few celebrities, leading the bikini boot camps and meeting some really good people. I have not woken up in the morning yet and dreaded going to work so that must be a good thing. Skye: As someone who’s visited The Grove I can vouch for the wonderful facilities and beautiful surroundings. For readers not lucky enough to have visited The Grove yet, give us a feel for what makes the place so unique? Mark: The Grove is set within 300 acres of rolling Hertfordshire parkland. There is so much to see and do here. From walking along the Grand Union Canal, exploring the bike trails in the woods to playing volley ball on the beach. The hotels facilities are second to none with 3 swimming pools, croquet lawn, tennis courts and a premiership standard football pitch not to mention three delicious restaurants to choose from. Skye: You’ve recently started a Blog where you post regular updates and articles. Where can people follow your Blog and what can they find there? Mark: I’ve always had a passion to write about fitness & nutrition and have been lucky to have been given the opportunity to write some articles for The Grove to go out in their monthly email newsletter. The articles will also be posted on my Blog in a section about me and other articles I’ve written. I also have sections dedicated to bodybuilding, powerlifting, and supplements which contain videos and other updates. Download Free Mark Alexander Workout Plans! and diet plan that you can download for free! This is the next best thing to a session with the man himself so go check them out! Skye: How can readers keep in contact with you?